Anyway, first up’s the spinning update. I bought one bigass spindle. It’s an Ashford, and the whorl is about 3.5″ in diameter – I think that qualifies as bigass. 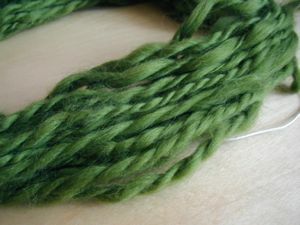 I don’t know how much it weighs or anything else, but I can get quite a bit of worsted-weight or slightly lighter (not too light – it’s rather heavy, of course) onto it. 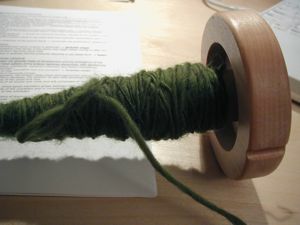 It spins quite well, and now that I’ve started doing a bit of off-the-leg spinning it goes for a good while. I made a center pull ball on a toilet roll (I think I need a noste. Or a niddy noste…). Then I made my first two-ply! Of course it’s rather inconsistent, but I love it. 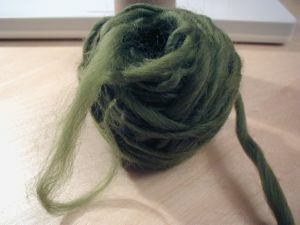 And it’s a fairly decent amount, so I think I’m gonna try and do up the rest of this green corriedale the same and see if’n I have enough to make something with. 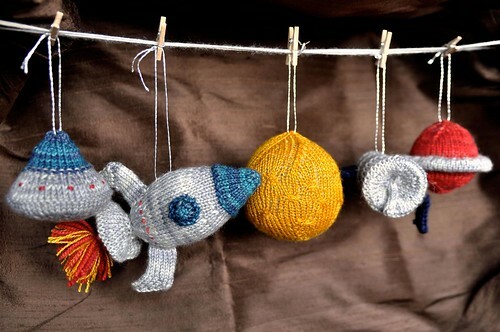 I er….bought some more yarn. Just a little, and it was $4.20 per ball. 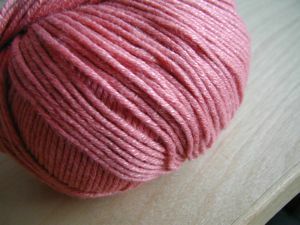 It’s Madil “All Seasons”, 50% cotton 50% viscose, in a lovely rose, and ridiculously soft. I’m going to make Soleil with it, probably rather soon because I want a fairly instant-gratification project, and tanks are like that. Oh, and the Phildar Jacket is now moving along nicely. The vertical buttonholes are kind of cool, but they’re also somewhat messy. I hope I can clean them up a bit afterward. This front should go along quickly tonight and I’ll probably get started on the second one as well – there’s a new CSI and ER, so that’s lots of knitting time! Ack! No more Cotton-ease? Nooooo! Now I need to try and order some while it’s still floating around but…but…the money…oh well. It’s one of my favourite yarns, what can I say? I guess this means I need to buy some, NOW. Leslie, Joyce, you guys want any? This weekend I want to get some sewing done as well, probably a skirt and/or try to finish up the dress I started last year (it stalled when I had to go buy a zipper). Just to test the waters, would any of you guys be interested in buying bags/purses if I started making them? 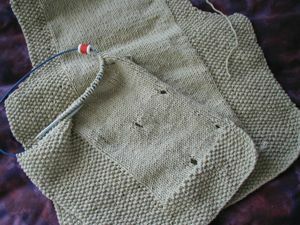 I usually do a tote-bag style, or messenger, big enough to hold your knitting, with funky fabrics. I’ll put up some pics soon. I don’t think they’d be very expensive (maybe $25-$50 CDN) and would be easy to ship too. Ideas, ideas.